So I’m in rehearsals for a comedic musical. I love comedy. I’m very “meh” about musicals; I don’t know much about them. I like combining familiar and strange things, so it’s great so far. I carry a big chunk of paper around what has the lines written on it. 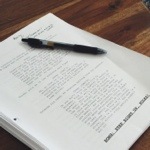 Some of the pages are typed, some of them are photocopies of the script from the original production in 1995. It’s held together with brads. It’s completely archaic. The director is kind of a “most interesting man in the world” kind of character. Mixed in with a little bit of the least organized person in the world. We have yet to receive the actual music for this musical. We learned the closing song for act one last night. The whole song has fewer than ten words in it. Basically, this is the opposite of all the computer things I do and it’s just about perfect. I know you are digging on paper here, but if you can get it into PDF or some other electronic form, http://quoteunquoteapps.com/weekendread is a nice app for viewing scripts on your iPhone.